Did you know that problems with clogged pores and skin eruptions are more prevalent in the fall than any other time of the year? One theory for this has to do with the weather change. During the summer many people attempt to clear up their skin by spending more time in the sun. The anti-bacterial properties of sunlight makes this an effective temporary solution for some people. But… at the same time you are drying up your blemishes you are also increasing a layer of thick, keratinized (hardened) cells. So, when fall rolls around and you’re spending less time in the sun that trapped oil, beneath the skin’s surface becomes a problem. The result is lots of bumps under the skin and increased blemishing. To further exacerbate this problem is the fact that when you’re in the sun, heat changes the consistency of the oil (sebum) in your pores to a much more liquid consistency. Then, when you’re out of the sun the oil becomes more viscous and is more easily trapped under the skin’s surface. To make matters worse, being exposed to sun decreases Langerhans cells in your skin. These cells are the skin’s first line of defense for your immune system. Depleting Langerhans cells increases the proliferation of bacteria thus instigating breakouts. Add to this the stress of going back to school or work. The elevated stress hormones trigger inflammation which again leads to more breakouts. Now is the time to make a clear skin commitment. Stop fall breakouts in there tacks by getting a Problem Skin Facial and then making a commitment to following a protocol that’s right for the needs of your unique skin type. The first step in performing a Problem Skin Facial should be an in depth Skin Analysis. Because not all problem skins behave the same way or are caused by the same triggers. Your esthetician should take a close look at your skin, discuss what’s going on and determine the steps needed to clear up your skin. For example, if clogged pores are your major problem you may benefit for coming in for weekly peels that will exfoliate away the dead clogging cells. If you have inflamed acne you need to focus on calming the inflammation first. Your esthetician should talk to you about ways to calm your skin, plus how diet and stress effects your skin and offer life style changes that will benefit the your skin’s health. Often exfoliating peels are the most dramatic solution to clearing away clogging, dead cells and establish a nice, smooth texture. Thick, sun exposed skin tends to do well with microdermabrasion treatments coupled with gentle lactic acid peels. Inflamed, problem breakouts may require a series of salicylic acid peels to kill bacteria. Very sensitive, inflamed problem skin may need to skip the acid peels altogether and rely on smart enzymes to like pancreatin to clear away clogging without irritation. The right peel will allow your esthetician to perform expert extractions that are essential for clearing up problem skin. Only a highly trained esthetician can recognize how to extract and decipher which blemishes and clogged pores should be extracted as well as which blemishes should be left alone. 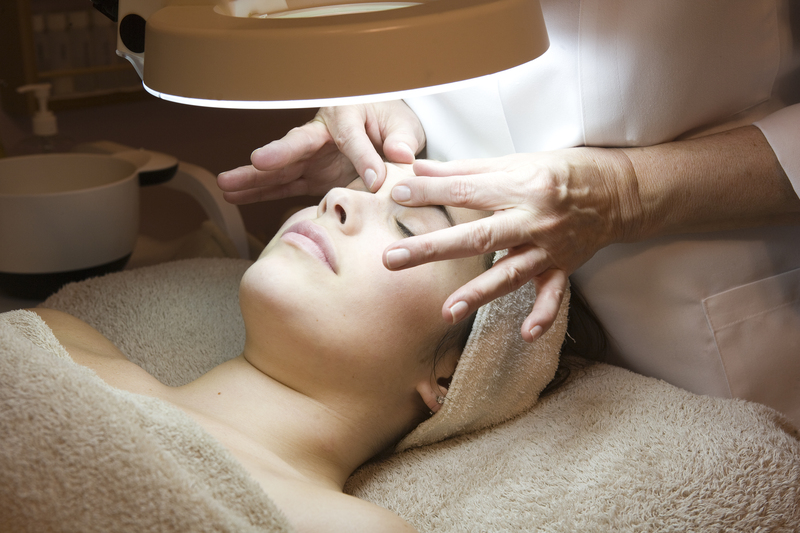 Calming and sedation is an integral part of a problem skin facial. Depending on the skin your esthetician may choose to use a blue LED light treatment which not only kills acne bacteria but calms those inflamed blemishes and promotes skin healing. A soothing masque should finish off your treatment. These types of masques might include soothing seaweed, azulene, antibacterial clays or anti-inflammatory licorice root extracts. Two essential areas to focus on is frequency of treatment and devising an individualized home care program. An expert esthetician can guide you towards the right course of action which is critical to getting the results you are looking for. Be proactive by making a clear skin commitment now. Start by booking a Purifying Problem Skin Facial and let your esthetician guide you to the best approach toward achieving complexion perfection.